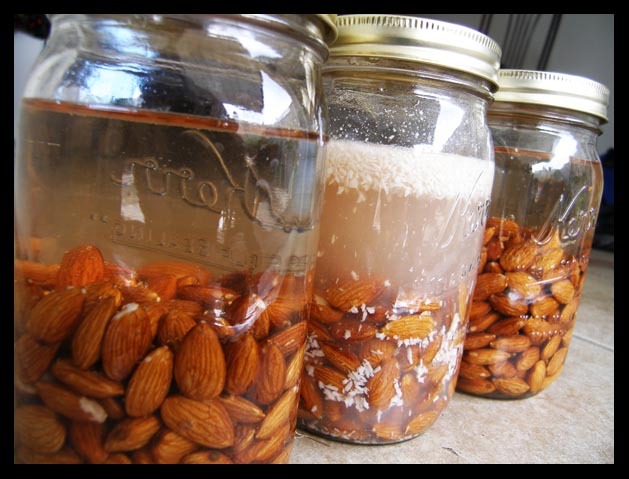 To start the basic recipe, soak 1.5 c almonds in a jar of water overnight. This makes the blending process much easier. I had three jars going because I planned to make regular, chocolate, and coconut almond milk varieties. (I know….yum!) I set mine to soak in the morning, then tucked them in the fridge when I went to bed for the night. The next morning, discard the soaking water (it tastes somewhat bitter—not very tasty), rinse the almonds, and put them in a blender along with 4 cups of water. (You can easily go up to 5 cups of water if you like to make it stretch, but I recommend trying it with four first and then thinning it more if necessary.) Blend it thoroughly while you line a sieve with a few layers of fine cheesecloth, then place the lined sieve in a bowl that leaves plenty of space for the milk to drain below. (I actually use an undyed pillowcase in a sieve for this, which works great, but cheesecloth is just fine and a coffee filter will do in a pinch.) Pour the almond milk into the lined sieve and then leave it sit to drain while you frolic, watch a movie, work, play with the kids, or save the world as necessary. Once it’s pretty much drained, gather up the cheesecloth or pillowcase and squeeze it firmly to remove the remaining liquid. It’s okay to get pretty aggressive here, particularly if you are using a sturdy bit of fabric like a pillowcase. You want to maximize the almond milk and also make sure the leftover meal is pretty dry. Set the almond meal aside and put the almond milk back in the blender. Add a pinch of sea salt, 1/4 tsp of vanilla extract, and 1-2 T agave nectar (depending on your sweetness preference). Give it a whir in the blender to mix. At this point, add more water to your milk if you prefer. Ta-da! You have almond milk! Blend and strain according to the instructions above. Refrigerate after making and consume within a week. Now, what to do with all that almond meal? Honestly, there are loads of possibilities. Toss it in a smoothie, use it as a base for raw food cookies, add it to a batch of granola, or whatever else you can dream up. I added a half cup of it to a loaf of bread in place of flax meal, and I used the majority of it for some tasty weekend cinnamon rolls. Those cinnamon rolls are actually worth talking about. Let’s talk about them! I used a basic cinnamon roll recipe from The Horn of the Moon cookbook, but instead of stuffing them with nuts, butter, cinnamon, and sugar, I made a tasty spread out of the almond meal. By mixing it with some maple syrup, agave nectar, vanilla, almond extract, cinnamon, and salt, it was transformed into something distinctly delicious. I made a double batch. We cooked up one set and carted them, still warm, to the neighbors. The second half was rolled out, filled, rolled up, and popped raw into the freezer to enjoy later. Raw cinnamon roll dough works wonderfully for freezing; just this morning, I sliced off two pieces with a serrated knife, let them thaw while we got dressed and took Hippo out, then popped them in the toaster oven to cook. Fresh-baked cinnamon rolls on a workday! Huzzah! And delightful with a mug of hot chocolate almond milk, I might add. And that’s the scoop on almond milk. Easy, delicious, carrageenan-free, and with the side benefits of cinnamon almond rolls and improved neighbor relations. Very interesting. Right before Christmas I bought some Egg-Nog and had a few glasses a couple of nights in a row, but realized that every time I drank it I felt awful! Cold sweats, stomach ache, nausea. The only ingredient I didn’t recognize in it was carageenen…maybe I am allergic? And now that I think about it, this also happens once in a while with ice cream, but not every ice cream. I’d like to expirament and see if it happens again with the carageenen, but it made me feel so awful that I think I won’t. 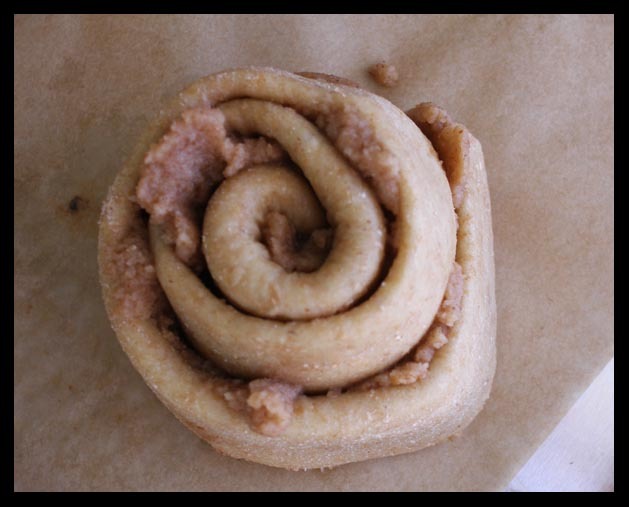 Thanks for sharing how to make Almond milk and those delicious looking rolls. And give Hippo a pet for me. That is interesting, Kim. I know commercial ice cream does depend on carrageenan, so it’s possible you have a sensitivity. Unfortunately, carrageenan is in a LOT of stuff. Whether or not you have a sensitivity, though, I am pretty convinced it’s a good idea to avoid it. More on that later. And Hippo is most appreciative of the pets. Poor guy had surgery today. He is officially down two testicles and one cherry eye. It’s been a very big day, and he’s awfully tuckered out. Can you fax me breakfast in the morning???? I’d love to try those rolls and almond milk. I’m interested to learn more about carrageenan too. I actually spent a lot of time last year thinking I was developing lactose intolerance (which “runs” in my family), because eating ice cream (not every brand and flavor though) was making me feel nauseated. I’m glad to hear Hippo has joined the same club as Buford. Maybe they can lament together over their missing testicles. Buford dreams about the day when Mommy and Daddy can afford to get him some “neuticles,” the cosmetic, faux testicle implants for dogs. I’ve never tried almond milk straight up (though I’ve mixed it into hot cereal on occasion) – how does it taste? I haven’t been able to find a local source of almonds, but I hope to, and it’d be interesting to learn more about almond milk and carrageean just for the sake of more knowledge. Andrea: Yeah, I saw the implants on the web the other day. Good Lord. And here I thought I’d seen it all. Mangochild: It’s pretty good, though we don’t really drink much of anything by the glass on a regular basis besides water. It’s mild, slightly sweet, slightly almondy. I think it would work well on cereals (hot or cold), as well as for homemade non-dairy ice cream. The chocolate almond milk was made for drinking, and the rest of it was intended for cooking, making hot cocoa, and the like. I hope to get to the carrageenan post over the weekend, as several people have expressed interest. Oh, poor Hippo…but it’s good that you did it so there will be no little Hippos running around. Really? Neuticals? That’s possibly the strangest, saddest, and yet funniest thing I have heard all day. Andrea- It’s funny you say that because I thought I was lactose intolerant too, but when I switched to soymilk I still had problems. And, I can drink milk just fine. It’s all so strange, but a carageenen sensitivity would make a lot of sense. Hmmmm…. I just tried the recipe for almond milk and was amazed to see the results. The milk is amaizing and as stated on the recipe above it is very simple to make. I gave it a little twist by adding a Tbs of Molasses and it enhanced the flavor of the milk a bit more. Nonetheles the way it is explained it is absolutely delicious!!!!! i searched your site for a post on the carageenan but found none. Did i miss it or did you not get to it yet? Very interested here. I have been turning all my nutrition clients onto almond milk and have been distressed to hear about the concerns of carrageenan. I dreaded trying to make my own, but this sounds do-able. I appreciate it! As you may have seen, blogging took a serious backseat over the past year as Work and general Life stepped up big time. However, I’ve got a more flexible schedule now and look forward to posting more! A cargeenan article will be coming up soon. Am interested in trying the recipe for almond milk. Was checking out the Dagoba’s website for th echocolate. What type of cacao did you get? 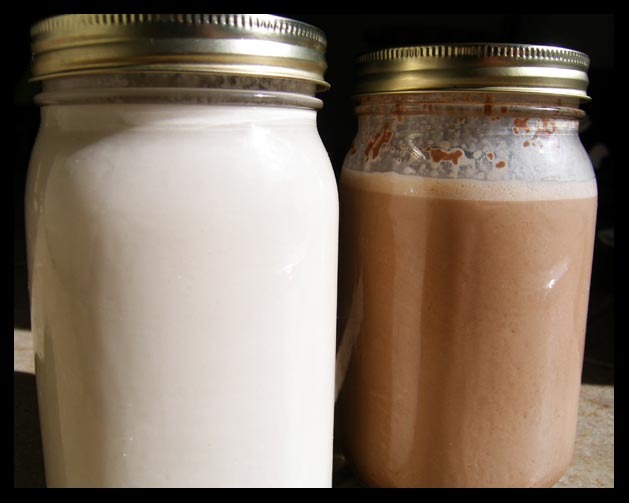 The drinking Chocolate (sweetened or unsweetened) or the professional cacao powder? 1.5 c is that 1.5 cups I presume? I used a French Press to strain the grounds out but ultimately I needed a cheese cloth to finish the job. Also the use of coffee filters was super slow with low yield. It will do in a pinch but it’s not recommended. Lois–Unsweetened, for sure. Other than that, either kind should work. Nico–Thanks for the feedback, and yes, c = cups. 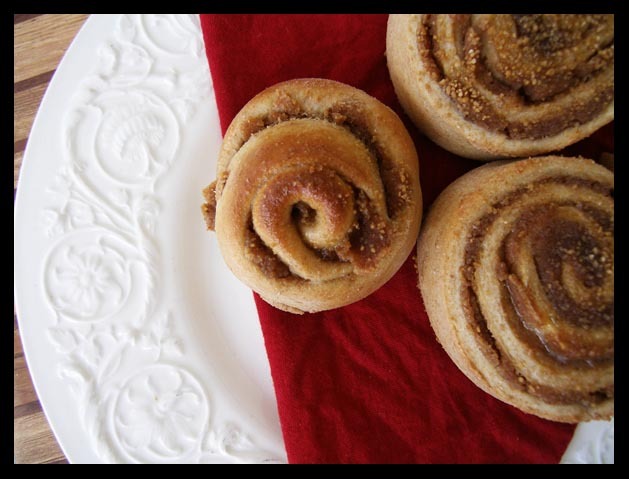 Kim–I used a basic cinnamon roll recipe from the Horn of the Moon cookbook. Any favorite recipe will do–just sweeten and spice the almond meal to taste and maybe add a dash or two of almond extract to the filling or the dough.